The AirPrint feature of iOS 4.2 promised to let you print, wirelessly, from your iOS device to any printer shared by your Mac. Unfortunately, AirPrint ended up working with only a few specific, AirPrint-enabled printers. One of the most popular recent Mac Gems, especially around the Macworld offices, is Printopia, a utility that delivers on Apple’s unfulfilled promise—and does much more. But Printopia had a number of other tricks up it virtual sleeve that made the utility useful even if you never actually needed to print. A special Send to Mac printer let you save—by printing—a PDF copy of a document, or a JPEG or PNG version of an image, to a Printopia folder in your Mac’s Documents folder. 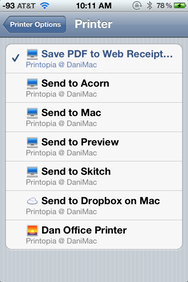 And a Send To Dropbox On Mac printer let you save a document to your Mac’s Dropbox ( ) folder, where the file is instantly synced to all your other Dropbox-enabled devices. These features were great for, say, saving receipts from online purchases made on your iPad or iPhone, and for transferring iOS screenshots to your Macs. Since that review, Ecamm Network has released several significant updates to Printopia, including version 2.0 in April and version 2.1.5 earlier this week. Those updates have included a number of new features that have made Printopia even more useful. For example, you can now create an unlimited number of Save To Mac and Save To Dropbox virtual printers, each of them saving documents to a different folder on your Mac or inside your Dropbox folder, respectively. You choose which of those folders to save to by simply choosing a different virtual printer when printing. Similarly, you can configure any PDF workflow—those options under the PDF pop-up menu in Mac printing dialogs—as a virtual printer, letting you process documents you print from your iOS device. To use the screenshot example again, you could set up a PDF workflow that opens an image in Preview, resizes it to a particular size, and then saves it, as a PNG file, in your Website Images folder. Also new since my original review is password security for each printer, real or virtual, so even if someone has access to your Wi-Fi network, they can’t print to your printer(s), or save files to your Mac(s), without the appropriate password(s). Similarly, you can now configure default settings for every printer. For real printers, this includes most of the settings—paper size, paper handling, layout, output quality—you’d see in a Mac OS X printing dialog. For virtual printers, you can change the name of the printer and, for save-to virtual printers, the save location and whether saved files are opened automatically. 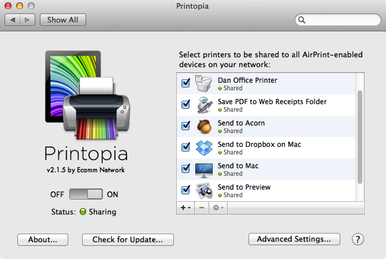 Another nifty new feature is support for AirPrint printing from Lion. In other words, all the options available to iOS devices on your local network are also available to any Macs running Mac OS X 10.7 or later. Using the Print & Scan pane of System Preferences (or by choosing the printer in the Printer pop-up menu in any OS X printing dialog), you can set up any Printopia-provided printer or virtual printer as a standard OS X printer. So you get the same save-a-Web-receipt-to-my-iMac and open-a-screenshot-on-my-iMac features on your MacBook as you get on your iPhone. This feature has a couple side benefits, as well. First, as long as your other Macs are running Lion, you can disable OS X’s Printer Sharing feature and just use Printopia—you don’t need to use Printer Sharing and Printopia to share your printers with both Macs and iOS devices. Second, if you’ve got a printer that doesn’t have Lion drivers, you can connect the printer to a Mac running Printopia under, say, Leopard and then print to that printer from any Mac running OS X 10.7, instantly adding Lion support. Ecamm has also fixed a number of minor bugs, such as one that reduced the quality of printed photos in certain circumstances, and added some useful tweaks. For example, Printopia can automatically fit your document to a each printer’s printable area, and when sending a photo to your Mac, the date and time the photo was originally taken are used both in the resulting file’s name and to set the date and time of the file itself. Printopia also now supports more printers, it supports duplex printing with particular printer models, and it works better with the OS X firewall. As with the original version, Printopia’s biggest limitation is that it requires that iOS devices—and, now, Macs running Lion—be on the same network with a computer that’s on and awake. But until the Ecamm folks can work technological magic, that limitation will remain, just as it does for OS X’s own Printer Sharing feature. Printopia was already one of our favorite bits of software, and with the improvements the developer has added over the past year, it’s even more of a must-have.